The two dogs in the photo below were dropped off at a central Florida animal shelter within a day of each other. They became instant best friends. 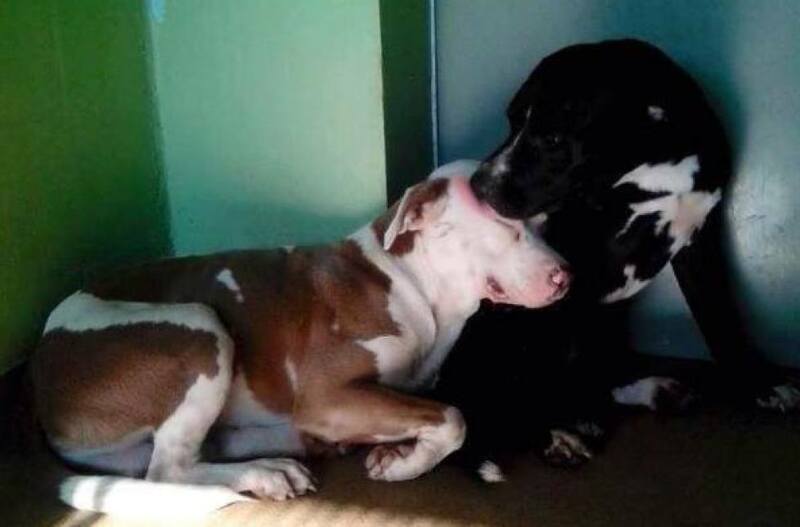 This photo of the dogs in the Florida shelter went viral after Second Chance Rescue posted it to their Facebook page. UPDATE, Sept. 17, 2014, 8:30 a.m.: More than $8.300 has been donated so far to help with the boy’s care — a huge and generous amount, that’s raised the hackles of some in the rescue community. Debbie Cardenas, who volunteers at the shelter where Ares and Zeus lived before Chewning took them home — and whose boyfriend Daniel Castro took the original photo, she says — tells HuffPost that she’s upset, among other things, at what she sees as money being diverted from helping other animals. Chewning has responded to some of the more personal attacks against her and her daughter on the Ares and Zeus Facebook page.